There’s nothing worse than getting really into a particular activity, bridging the gap between novice and expert, and having a lot of fun while doing it. Wait a minute — that’s the ideal situation. What we meant was that there’s nothing worse than getting good at something, eventually mastering the craft while having fun doing so, only to be halted because, all of the sudden, you got injured. There’s really nothing more discouraging than that. Of course, what’s discouraging and what’s not is at least a little subjective, but our point is that, when you’re learning something new, it’s important to learn how to do it the right way. A major part of that is ensuring that you do something safely to avoid any potential injuries, especially when it comes to a physical activity like dancing. Do you know how to approach dance safety? 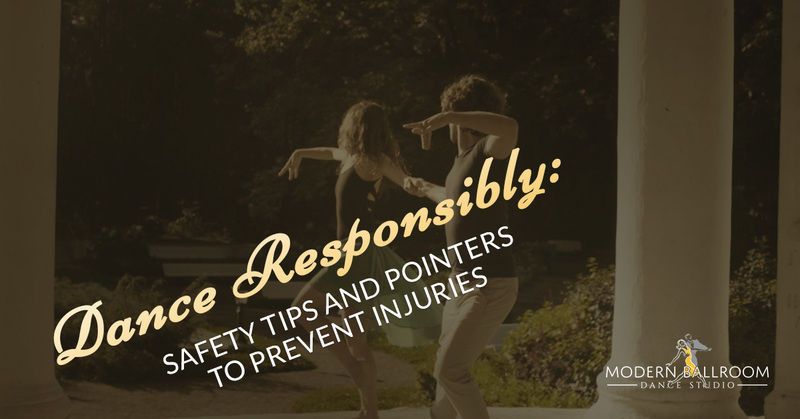 No, we’re not referring to the 1982 hit song by “Men Without Hats,” but we are going to touch on safety tips that we preach day in and day out at our ballroom dance studio in Woodbridge. Above all else, the safety of our dance class attendees is our highest priority. We’d never push an advanced dance technique on a novice, nor do we condone doing the splits if you’re not flexible. In any case, we take injury prevention seriously at the Modern Ballroom Dance Studio. Check out our advice on dancing safely below, and for something a little more fun and less “rule-oriented,” feel free to check out our social ballroom dance lessons for casual dancers and our complete list of class descriptions to find a style of dancing that really speaks to you. We’re excited to see you moving at one of our adult dance classes! Stilettos might look stunning for a fancy night out, but they’re a poor choice of shoes to wear at our dance studio. In some cases, our dance class attendees may wear flats or even no shoes at all, as the point is to have even contact with your feet and the floor. Dancing requires a lot of balance and poise on the feet, and any shoes that make your feet feel clunky aren’t going to help. We also recommend wearing clothing that’s somewhat tight to the skin, but not overly restrictive. Spandex or other dry-wicking sports materials are great for movement and reducing sweat. Trying out a fad fasting diet right before attending one of our ballroom dance classes is a poor idea. Before you head on in, make sure that you’ve been drinking plenty of water and that you’ve eaten somewhat recently (but not too recently because you also shouldn’t feel overly full). It’s horrifying to witness a class attendee faint as a result of dehydration or a lack of nutrition so take care of your body beforehand as if you’re engaging in any other physical activity. Not unlike running or playing a sports game, stretching and warming up your muscles will help reduce the chances of any dance-based injuries from occurring as well as reduce the level of soreness that you might experience (trust us, it happens). It’s also not a bad idea to warm up your muscles cardio-wise by doing things like jumping jacks or jogging in place before a particularly vigorous and inspired dance lesson. Naturally, this all comes down to the relative skill level of the dance class that you’re partaking in. Pay Attention to Your Instructor! We’re proud to have a team of true dancing professionals that are as passionate as they are knowledgeable about many different styles of dancing. Not only will they help you nail down a particular technique, but they’ll also make sure that you do it safely. Should they notice anything that’s overly incorrect in your form, lay your ego aside and listen to what they have to say. You won’t regret it. If you’ve dreamed about being a proficient dancer for your upcoming wedding or even just dancing socially with friends, now is the time! Safely dance your way to success with the team at the Modern Ballroom Dance Studio and sign up for a first-time class today.